Ella's Favorite is made by hand in small batches with the following: organic oats, Ohio maple syrup, raw organic pumpkin seeds, raw organic sunflower seeds, organic raisins, organic cranberries, organic cherries, organic brown sugar (organic evaporated cane juice and organic molasses), Ohio made vanilla (cold-extracted matter of Madagascar bourbon vanilla beans, water and alcohol) and organic spices. Gluten Free Ella's Favorite is made by hand in small batches with the following: organic gluten free oats, Ohio maple syrup, raw organic pumpkin seeds, raw organic sunflower seeds, organic raisins, organic cranberries, organic cherries, organic brown sugar (organic evaporated cane juice and organic molasses), Ohio made vanilla (cold-extracted matter of Madagascar bourbon vanilla beans, water and alcohol) and organic spices. Autumn's Best is made by hand in small batches with the following: organic oats, Ohio maple syrup, raw organic pumpkin seeds, raw organic sunflower seeds, organic apricots, organic cranberries, organic brown sugar (organic evaporated cane juice and organic molasses), Ohio made vanilla (cold-extracted matter of Madagascar bourbon vanilla beans, water and alcohol) and organic spices. Gluten Free Autumn's Best is made by hand in small batches with the following: gluten free organic oats, Ohio maple syrup, raw organic pumpkin seeds, raw organic sunflower seeds, organic apricots, organic cranberries, organic brown sugar (organic evaporated cane juice and organic molasses), Ohio made vanilla (cold-extracted matter of Madagascar bourbon vanilla beans, water and alcohol) and organic spices. Summer Time is made by hand in small batches with the following: organic oats, Ohio maple syrup, raw organic pumpkin seeds, raw organic sunflower seeds, organic raisins, organic dates, organic blueberries, organic brown sugar (organic evaporated cane juice and organic molasses), Ohio made orange oil (soy oil and natural orange flavor), Ohio made vanilla (cold-extracted matter of Madagascar bourbon vanilla beans, water and alcohol) and organic spices. Gluten Free Summer Time is made by hand in small batches with the following: organic gluten free oats, Ohio maple syrup, raw organic pumpkin seeds, raw organic sunflower seeds, organic raisins, organic dates, organic blueberries, organic brown sugar (organic evaporated cane juice and organic molasses), Ohio made orange oil (soy oil and natural orange flavor), Ohio made vanilla (cold-extracted matter of Madagascar bourbon vanilla beans, water and alcohol) and organic spices. Vibrant Winter is made by hand in small batches with the following: organic oats, Ohio maple syrup, raw organic pumpkin seeds, raw organic raw sunflower seeds, organic raisins, organic figs, organic brown sugar (organic evaporated cane juice and organic molasses), raw organic cacao powder, Ohio made raspberry extract (propylene glycol water and natural flavor), Ohio made vanilla (cold-extracted matter of Madagascar bourbon vanilla beans, water and alcohol) and organic spices. Gluten Free Vibrant Winter is made by hand in small batches with the following: gluten free organic oats, Ohio maple syrup, raw organic pumpkin seeds, raw organic raw sunflower seeds, organic raisins, organic figs, organic brown sugar (organic evaporated cane juice and organic molasses), raw organic cacao powder, Ohio made raspberry extract (propylene glycol water and natural flavor), Ohio made vanilla (cold-extracted matter of Madagascar bourbon vanilla beans, water and alcohol) and organic spices. 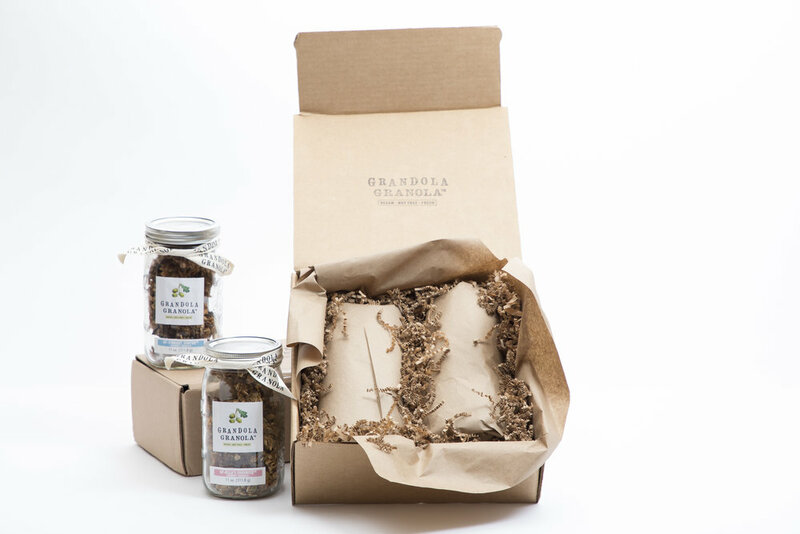 Our gift boxes include two jars of the Grandola Granola of your choice! As always, all of our granola is made by hand in small batches. 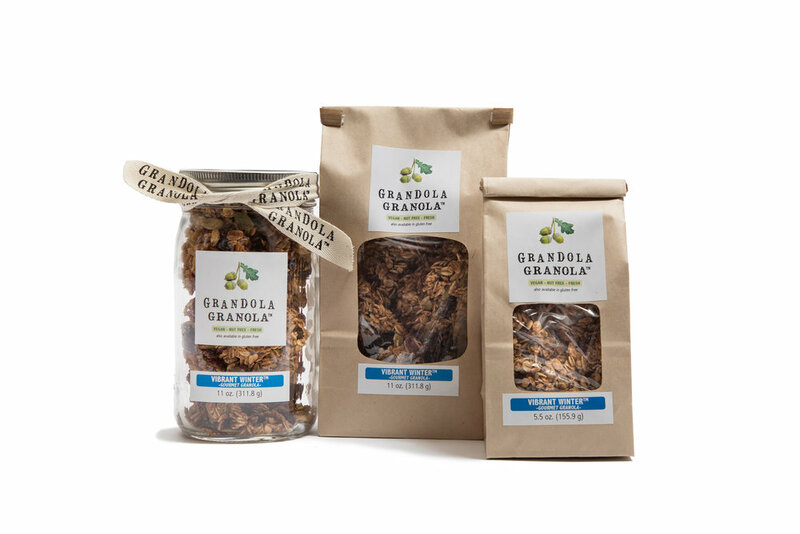 Our gift boxes include two jars of the Gluten Free Grandola Granola of your choice! 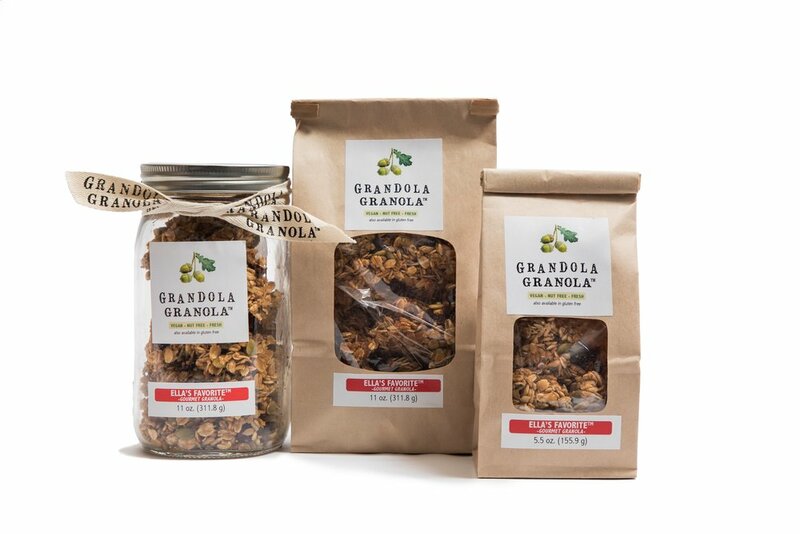 Our sample set includes 3oz jars of Ella's Favorite, Autumn's Best, Vibrant Winter, Summer Time Grandola Granola so you can try all of our varieties. 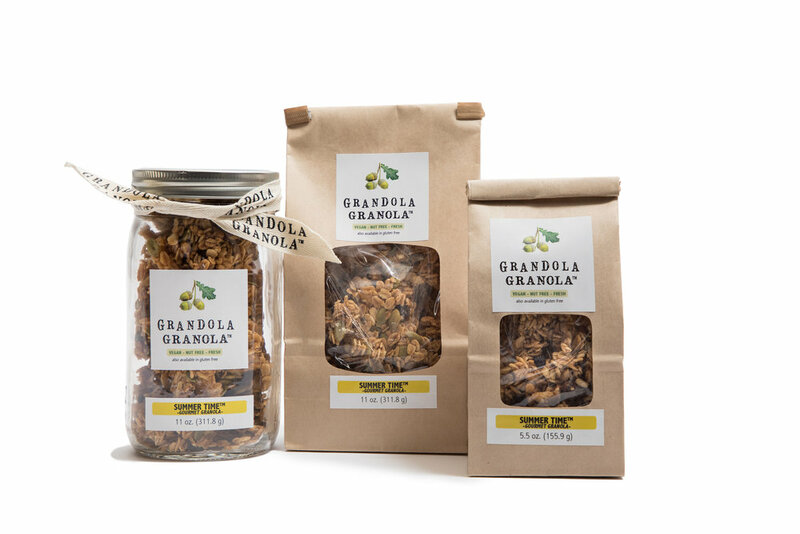 Our gluten free sample set includes 3oz jars of Ella's Favorite, Autumn's Best, Vibrant Winter, Summer Time Grandola Granola so you can try all of our varieties. All gluten free.